Maddix Park | Never Count Reed Out ! 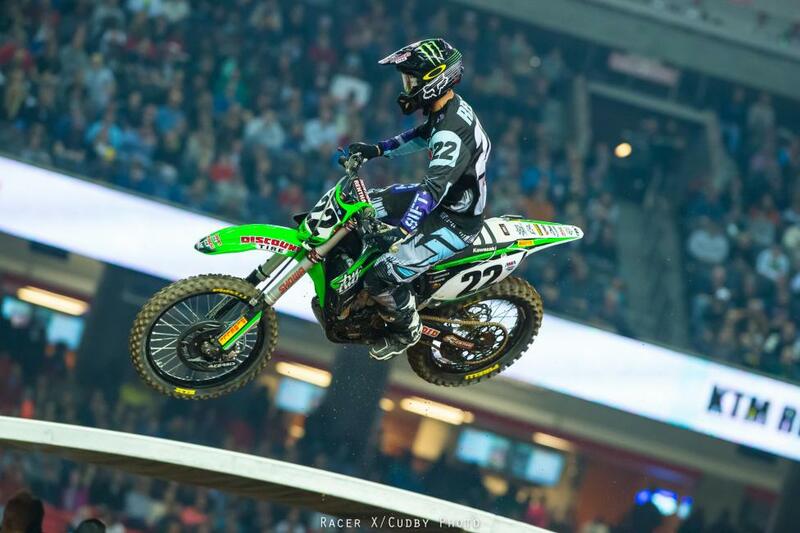 Chad Reed. Chad freaking Reed. 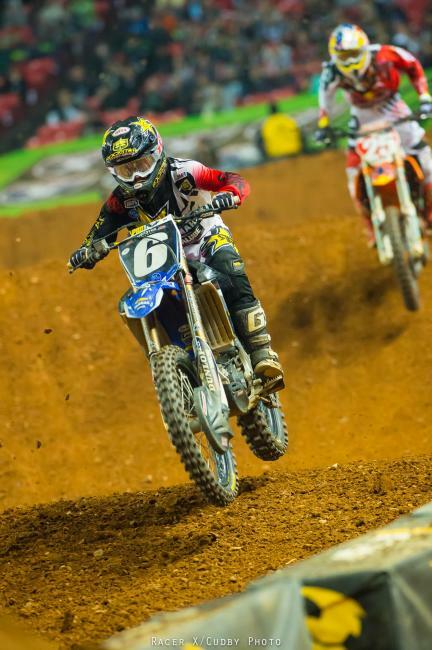 Ever the opportunist, the two-time champion grabbed the holeshot and took off early, and with contenders mired in the back, he got on the gas and rode his heart out to extend the lead. 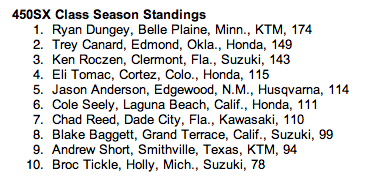 Weston Peick and Phil Nicoletti were second and third early, then Ryan Dungey got past to get to second. 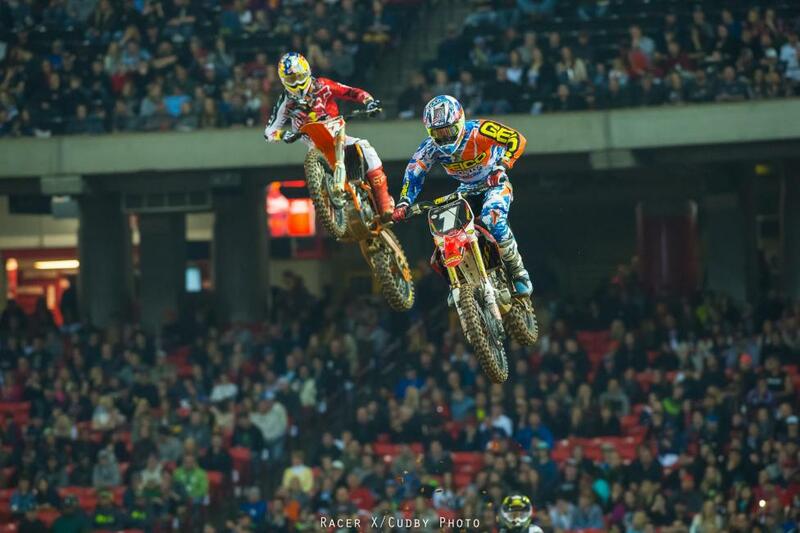 Dungey rode well, dug deep, and at one point got within a second of Reed. But the veteran sliced through traffic well, held up tough under pressure, and held on for the victory. You can just never ever count him out. Click here for race highlights. 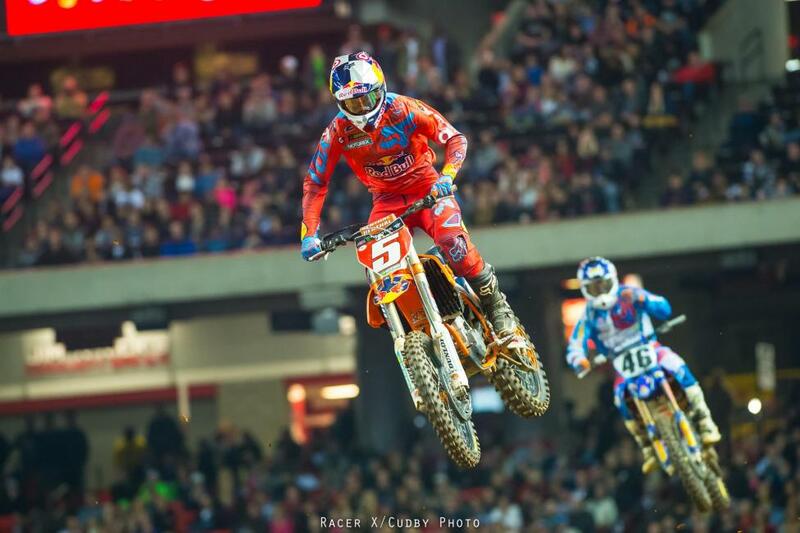 Dungey had a great points night, though. Trey Canard was fast all day but started about 11th, he fought the whole way to get in sight of Dungey but couldn't quite get to him, he took third. 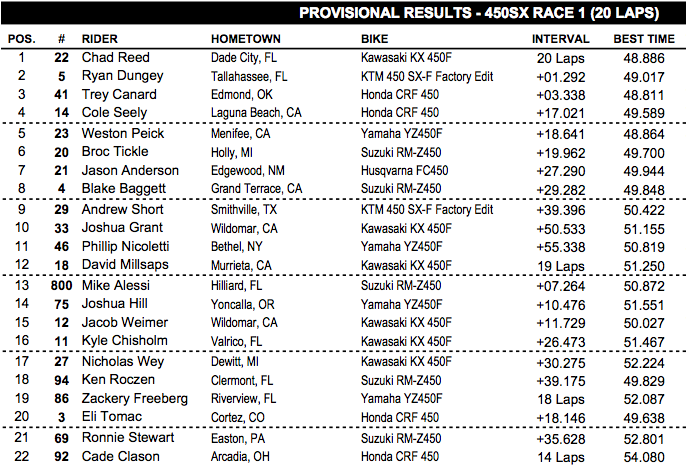 Cole Seely and Peick rounded out the top five. 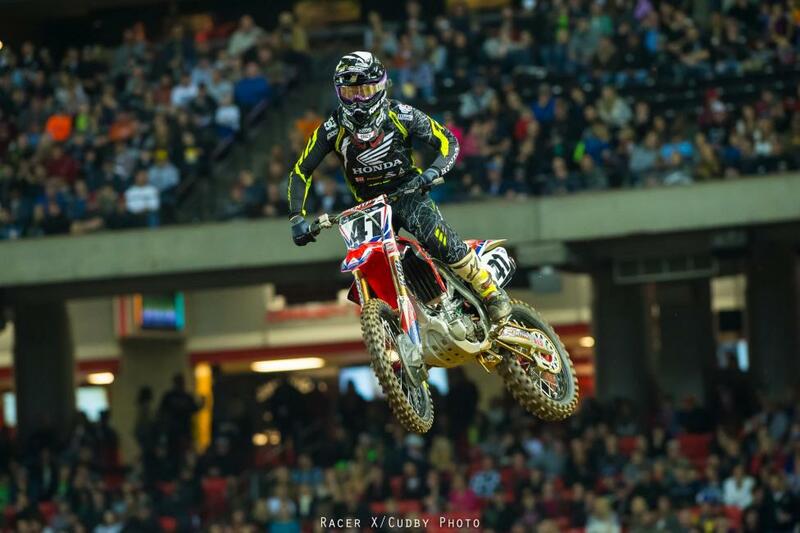 Championship contenders Ken Roczen and Eli Tomac had terrible nights. Roczen crashed hard and got up slow, he got back on the bike and salvaged a few points with 18th. Click here for his crash. Tomac crashed and had to visit the mechanic's area to straighten his bike, he got back out there but took 20th. Late in the race Canard's Honda teammate Cole Seely rallied to fourth, ahead of Weston Pieck, who returned from injury, started second, and kept Reed and Dungey honest for a bit. Peick's been dealing with injuries and lost a little fitness, he went back to fifth. What a race! WHAT A RACE! Bogle grabbed the lead down the start straight but Davalos sliced inside to grab the holeshot. 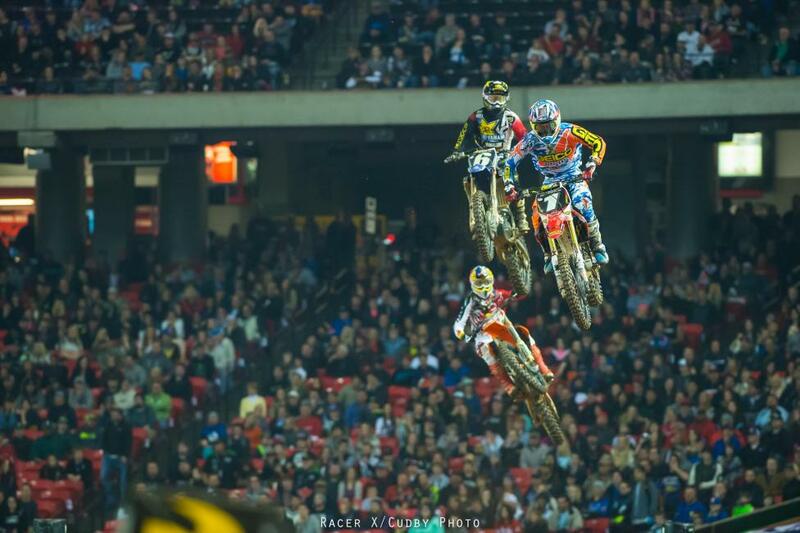 Behind them came Friese and Lemoine, Musquin and Martin. Musquin and Martin managed to get past the dueling privateers, but Davalos looked solid out front for the first half of the race. Then Bogle turned it up and starting going to work on Davalos for the lead, just as Martin was challenging Musquin for third. Musquin bobbled and couldn't jump a triple, and this put Martin into third. Davalos still held the lead until he completely fell apart on one lap: he made a bunch of mistakes and Bogle, Martin and Musquin all went past. It still wasn't over, though. 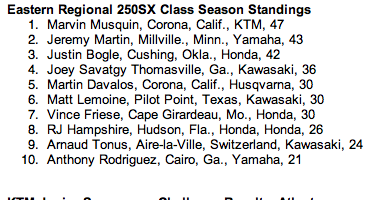 Musquin was working Martin, Martin was working Bogle, they were all over each other! At one point Bogle bobbled, Martin went for it, couldn't find room and got slowed up, Musquin tried to pounce and make a pass, couldn't make it stick, and then cased a jump. It was crazy! With three laps to go, Martin blasted through the whoops and blew past Bogle to get the lead, then launched a sprint to the finish to get away. He won it, his second career 250SX win and an impressive won--he passed Davalos, Musquin and Bogle to do it. Well done by the Yamalube/Star Racing Yamaha man. Bogle bobbled again and Musquin got him for second. 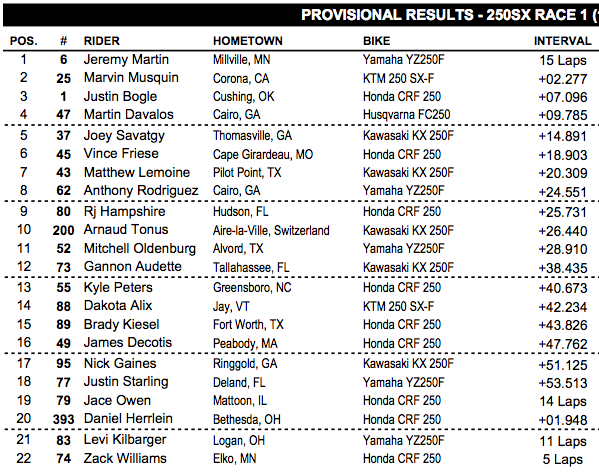 Davalos was fourth, Joey Savatgy got by the Friese/Lemoine battle to take fifth. Lemoine and Friese took it to the last lap, and Friese took the spot after 15 laps of action.